There are many types of ideas and purported cloud computing implementations that are available today. Many leading vendors and providers have “outsourcing” models that currently support private as well as public cloud computing infrastructure. Examples of PaaS (platform as a service), SaaS (software as a service), IaaS (infrastructure as a service) and the like abound today. Leaders in this whole space (AT&T, IBM, Oracle, Microsoft, HP, Amazon as well as other smaller companies) are in the cloud computing space. However, it is clear that the missing dimension is one that can cover user requirements in such a manner that an actionable computing architecture can be created so as to drive the real-world implementation of this type of service offering. An excellent paper published by K. Mukherjee and G. Sahoo [Reference 1], in the 2009 IEEE “International Conference on Advances in Computing, Control and Telecommunication Technologies”, has provided a great deal of insight into the mathematical modeling framework vis-à-vis cloud computing as a whole. This excellent paper explains, in a very lucid manner, all the details of what the agenda of cloud computing is, along with details of runtime entities involved in cloud computing, as per the practical needs of users who pay for the services on a “pay-per-usage” or “dedicated basis”. The other set of great work has been done by Joe Weinman of AT& T [Reference 2] who has put forth multifarious papers and discussion blogs that point to the business value of cloud computing. He has described and proved many aspects of how cloud computing will work with the present backbone infrastructure already available (through telecommunications companies/providers) and what it means to migrate to such an environment. Joe Weinman has compared all his mathematical proofs, business value propositions and recommendations based on the fundamental model of a “utility company model”. He has published so many great papers that explain cost factors, peaks, demands and how to optimize cloud computing for all types of users depending on their needs. Joe Weinman has done seminal work on topics covering “Mathematical Proof of the Inevitability of Cloud Computing”, “Cloudonomics”, “Hybrid Cloud” and “Virtual Private Cloud”, all of which present the pellucid models of working with cloud computing independent of which vendor is involved. It is also worth mentioning, at this juncture, that I [the author of this Infosys paper (Dr. Mathews K. George)] have derived wonderful inspiration provided by all the works of Peter Fingar (the ultimate guru of BPM – business process management – among other things) in the discipline of cloud computing. Peter Fingar has published a book called “Enterprise Cloud Computing” [Reference 3] as well as a seminal paper called “Fractal Enterprise Architecture and Agent-Oriented BPM: Can UML or BPMN Model a Cloud?” from which some ideas for this paper have been taken. Some examples of true cloud computing implementations for lay persons (users) are the Turbo Tax, Sales Force and Amazon web sites as well as their backend systems in their respective clouds. In more ways than one can imagine, these pioneering companies have been providing utility-like services for any user and everything is based on a cloud computing agenda. Sun Microsystems was one of the pioneers in envisioning the “network as the computer” paradigm and they had come up with actionable architecture models for cloud computing as one of the first in the race. I [the author of the current paper] have used many of the fundamental ideas from Sun’s seminal work without focusing on proprietary technologies but more on open-source platforms. With the above referenced inspirations, and borrowing ideas from 3 models [Reference 4, Reference 5, Reference 6], I [the author of this paper] have ventured onto an attempt to capture an actionable architectural model for cloud computing by demonstrating the abstract steps needed. This approach will show how to map the user requirements (use cases) and business processes to specific artifacts that will form the architecture of cloud computing in the real world. 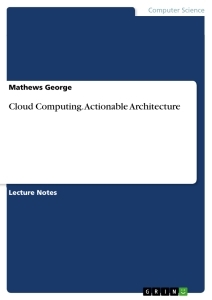 The purpose of my paper is to justify that “Cloud Computing” is a metaphor for the Internet/Web. As stated by all the experts (alluded to in the references), “Cloud Computing” is all about accessibility of platforms, infrastructure, software, applications, systems and the like for satisfying the needs of users and to enable them to work in a virtualized environment. This implies that everything they (the users) need will be driven from the physical CSB (cloud service bus) which contains a mixture of hardware, firmware, software, data, storage, power grids and the like to keep all systems running efficiently with full “fault-tolerance”. It is currently upon all of us to realize the fact that enterprises are moving on to actionable CSB (cloud service bus) infrastructures. What this implies is that users will be enabled to do all routine work with minimal investment at home or office and will also be able to connect to a choice of any operating system, applications, storage, data, information flow and all types of hardware or firmware. The very physical realities of traditional business processes are now ripe for change. This, according to Peter Fingar, means that the complex global enterprise goes beyond a flat plane. He states that fractal geometry principles provide a fresh foundation for business modeling and Enterprise Architecture. According to the works of Peter Fingar [Reference 3], any company is just a complex social system, a system that must be treated as such, a complex organism of many dimensions and components – customers, producers and suppliers (and their information systems) fused together as one to create Value Networks . The days of the vertically integrated or one-dimensional company are over. Linear value chains have morphed into complex, multi-dimensional business eco-systems that have a lifecycle that goes from “birth” to “optimization” and on to a “state of entropy” as do all systems in the universe. Hence, all cloud computing systems will follow an EA (Enterprise Architecture) model as well as new tenets of BPM (Business Processing Management) models to accommodate complex variations of demand-supply and the phenomenon of value networks will provide new dimensions as business drivers. The core business driver of any enterprise vis-à-vis cloud computing revolves around 3 fundamental tenets – (1) interfaces, (2) information and (3) messages/services. These 3 dimensions are very crucial in all forms of communications amongst various applications or systems. Furthermore, CSB will also have to cover other aspects for the enterprise-wide needs like software, hardware, networks, systems, workflows and business processes (to name the most important). The total value for any business will be judged by lower costs, higher qualities and total reliability of any service provided to users. This means that a CSB (cloud service bus) will be able to take care of IaaS, PaaS, SaaS or any other type of need that can be classified as a utility service for all types of users. In summary, the following are some of the greatest business benefits vis-à-vis cloud computing. -Business Agility – The infrastructure will be rapidly scalable for all types of users within the shortest possible time with horizontal as well as vertical scaling of all components. -Efficiency – Virtualization will drive all operations and IT costs will drop down with high quality outputs for all users. -Data Center costs will be driven down to the best levels and only operational efficiencies need to be accounted for. -Capital Expenditure will be reduced. -There will be no need to “over-provision” any type of service because everything can be scaled dynamically on parallel processing levels (massive scaling at rapid time intervals). -All life cycles will become dynamically flexible and this includes hardware, firmware, software and everything that goes into making the infrastructure operational. This paper will demonstrate a pragmatic methodology, used in conjunction with UML (unified modeling language), for describing CSB vis-à-vis cloud computing and businesses around it. The theme of this paper is centered on the abstraction of “Cloud Computing” as a CSB model with a focus on how to build an actionable architecture through MDA (model driven architecture) principles. The formal model of a CSB allows a system to have other systems as inputs and outputs. Therefore, the system that accepts other systems as inputs can be considered a “metasystem” from the input systems context. There could be many layers of “metasystem and system” pairs. In this type of model for a CSB, systems engineering activities become the main focus in order to determine design considerations revolving around demand, supply, peak loads, mean and median (to name just a few salient parameters) on developing and deploying a utility-type set of services that form the foundation of cloud computing. The following lists all the 6 requirements which are foundational to CSB.